Berserk And The Band Of The Hawk PS4 Review - Maximum Carnage — GamingWithSwag.com - Dads By Day, Gamers By Night. Graphics/Style: The style is obviously Dynasty Warriors, but it is heavily themed in the Berserk universe. Music/Soundtrack: The soundtrack is fine, not deterring from gameplay at all, the sound effects are all excellent. Story: You are the mercenary Guts traveling through the land who meets up with a band of other mercenaries and assists in their trials in battle. I do not want to spoil too much more of the story, but I will say like the Manga / Anime / Movies, the storyline is complex and really engages the player. Replay-ability: Moderate, there are more characters to unlock and challenges to complete. There is also an "Infinite Eclipse" mode, which essentially and endless mode where Guts must fight through hundreds of waves of foes. Time Commitment: You can finish a level in story mode in around 10-25 minutes, depending on the level. Value: There is a ton of content. In fact, I am used to the older Dynasty Warriors games where they ended up being relatively short in length. That is not so here. There are 46 missions in story mode, taking about 10 hours to complete. This does not include if you wish to sit through some lengthy cut scenes and read through the side stories between levels. Favorite Element: When you fill up your rage meter and just wreck shop on hundreds of enemies. There is nothing more satisfying than taking a giant sword and cutting through the bad guys. Dynasty Warriors 2 was first introduced to me as a launch title for the PlayStation 2 back in the Fall of 2000. I purchased it based on previews and reviews stating that it was one of the must have launch titles for the system. A 3-D hack and slash based on ancient Chinese history, the game boasted dozens of enemies on the screen at one time. Becoming hugely successful, the series has spawned dozens of sequel and spinoffs using this same formula. The developer Omega Force has acquired the Berserk license, a popular Japanese manga and anime series. Combining both Dynasty Warriors 2 and Berserk this breeds Berserk and the Band of the Hawk that has just been released for PlayStation 4, PC, and Vita. Starring Guts, you are a lone mercenary that is wandering the land looking for work. However, Guts is haunted by strange nightmares that foreshadow events to come. Following closely to the manga, the story takes a few unexpected twists and turns that really you need to experience for yourself. Bottom line, you carry a giant sword and hack through thousands of enemies and it's a lot of fun. You can form a strategy, find items and bonuses through a level just like in Dynasty Warriors, but storyline is where this one shines. I never thought I would be emotionally attached to any of the characters in this universe, not ever experiencing any other part of this universe except the Sega Dreamcast game. The story is complex, emotional, and sometimes downright weird. But it's one that engages the player and encourages them to proceed through the story mode of the game to find out what happens next. For fans already immersed in the Berserk universe, it will be exciting to play out some of their favorite scenes on the battlefield. You really shouldn't mess with Guts. It's a long game, 46 story missions, all ranging between 10-25 minutes each depending on the mission. This does not include animated cut scenes which can reach up to 20 minutes in some spots and text-based side stories that are unlocked by completing missions. There is a ton of extreme violence, nothing to the point of a cringeworthy fatalities of Mortal Kombat X, but it's a hack and slash with a lot of blood and some disturbing scenes. The only main issue I have with the game is that within the first week of release there was DLC available with an additional 10 missions, horses, and costumes. When purchased separately, this totals over $30.00, making the purchase of all Berserk and the Band of the Hawk content totaling over a whopping $90.00. It's a little bit a slap in the face, especially considering how loyal both Dynasty Warriors and Berserk fans both are to their respective franchises. If the game were any shorter, I probably would be deducting another rating level. Taking down an Officer will demoralize the rest of the army nearby. Despite this DLC issue, Berserk and the Band of the Hawk is a solid good time. Fans of both franchises will not be disappointed in hacking and slashing through waves of enemies and performing epic special moves that are learned as you progress through the game. It's a natural match of the two genres, which makes you wonder why this hasn't been done before? It's a nice change of pace from the adventure games I have been playing lately, as it is just near mindless fun. So sit back, relax. Grab a copy of Berserk and The Band of the Hawk and enjoy wielding that giant sword. 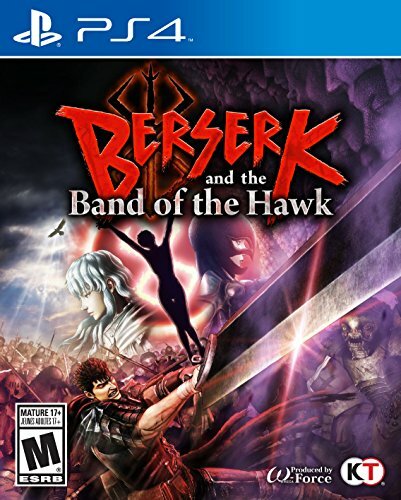 Berserk and the Band of the Hawk is now available on the PS4(Physical/Digital), digitally on the PS Vita, and on Windows PC via Steam®.